"A rich, much-needed remedy for the standardized institutions that comprise too much of our school system today… ideal for teachers and parents intent on resurrecting and fostering students' inherent drive to learn…An essential resource." “Schools that Learn is a magnificent, grand book that pays equal attention to the small and the big picture - and what's more integrates them. There is no book on education change that comes close to Senge et al's sweeping and detailed treatment. Classroom, school, community, systems, citizenry---it's all there. The core message is stirring: what if we viewed schools as a means of shifting society for the better!" Revised and updated - with more than 100 pages of new material – for the first time since its initial publication in 2000 comes a new edition of the seminal work acclaimed as one of the best books ever written about education and schools. 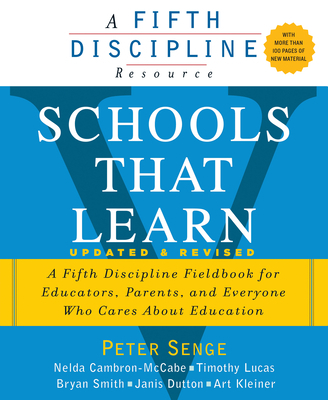 A unique collaboration between the celebrated management thinker and Fifth Discipline author Peter Senge and a team of renowned educators and organizational change leaders, Schools that Learn describes how schools can adapt, grow, and change in the face of the demands and challenges of our society, and provides tools, techniques and references for bringing those aspirations to life. The new revised and updated edition offers practical advice for overcoming the many challenges that face our communities and educational systems today. It shows teachers, administrators, students, parents and community members how to successfully use principles of organizational learning, including systems thinking and shared vision, to address the challenges that face our nation's schools. In a fast-changing world where school populations are increasingly diverse, children live in ever-more-complex social and media environments, standardized tests are applied as overly simplistic "quick fixes," and advances in science and technology continue to accelerate, the pressures on our educational system are inescapable. Schools That Learn offers a much-needed way to open dialogue about these problems – and provides pragmatic opportunities to transform school systems into learning organizations. Schools That Learn is the essential guide for anyone who cares about the future of education and keeping our nation’s schools competitive in our fast-changing world. PETER SENGE is a senior lecturer at the Massachusetts Institute of Technology, and the founding chair of The Society for Organizational Learning. A renowned pioneer, theorist, and writer in the field of management innovation, he is the author of the widely acclaimed book, The Fifth Discipline: The Art and Practice of The Learning Organization. In 2008 the Wall Street Journal named Dr. Senge among the top 20 most influential business thinkers. The Journal of Business Strategy has named him as one of the 24 people who had the greatest influence on business strategy over the last 100 years. The Financial Times named him as one of the world’s “top management gurus,” and Business Week has rated him as one of The Top (ten) Management Gurus. BRYAN SMITH is an internationally recognized author, speaker and consultant on leadership development, vision-based planning and organizational learning. Prior to founding Broad Reach Innovations, Bryan was a Senior Partner for eighteen years at Innovation Associates, the firm that pioneered the field of Organizational Learning. He has worked with the UN Foundation, the UN Office of the Secretary-General, and many other education, governmental, non-profit and business organizations worldwide. He is a founding faculty member for the Sustainable Enterprise Academy at York University in Toronto. NELDA CAMBRON-MCCABE is a professor, Department of Educational Leadership, Miami University (Ohio), and a nationally known expert on school reform and leadership. She is co-author of The Superintendant’s Fieldbook (2005) and co-author of Public School Law: Teachers’ and Students’ Rights 6th ed.(2009). Since 2007, Dr. Cambron-McCabe has worked with the National Superintendents Roundtable as its members initiated educational reform in their school districts. Many of their experiences appear in Schools That Learn. TIMOTHY LUCAS is a founding member and lead consultant for The Institute for the Future of Learning, a non-profit group focused on creating sustainable 21st century learning environments, and is an adjunct professor at Wilkes University in Pennsylvania. He has been involved with public education for the past 35 years, having taught elementary school, middle school, high school, and college. He has been a middle school vice principal, elementary principal, curriculum director, Assistant Superintendent, and Superintendent of Schools. JANIS DUTTON is an education writer, consultant, director of a peace and justice center,and community activist. She has used the learning organization principles as an elected official and in a variety of community conversations, and leadership and grass-roots initiatives. ART KLEINER is the editor-in-chief of strategy+business, the award-winning management magazine published by Booz & Company. Kleiner is also a writer, lecturer and commentator, and author of The Age of Heretics: A History of the Radical Thinkers Who Reinvented Corporate Management and Who Really Matters: The Core Group Theory of Power, Privilege, and Success. This book is part of the Fifth Discipline Fieldbook series, which also includes The Fifth Discipline Fieldbook and The Dance of Change (coauthored by Senge, Smith, Kleiner, and others.) Senge and Smith are also coauthors of The Necessary Revolution. “Schools that Learn is a magnificent, grand book that pays equal attention to the small and the big picture - and what's more integrates them. There is no book on education change that comes close to Senge et al's sweeping and detailed treatment. Classroom, school, community, systems, citizenry---it's all there. The core message is stirring: what if we viewed schools as a means of shifting society for the better! "A rich, much-needed remedy for the standardized, assembly-line, industrial-age institutions that comprise too much of our school system today. Chock full of useful tools, ideas, and exercises, this book is ideal for the many teachers and parents who are intent on resurrecting and fostering students' inherent drive to learn. For educators working to reconnect learning with real life, SCHOOLS THAT LEARN is as essential resource." "This book is an absolute feast of riches; its many stories and case examples prove once again that 'the solutions we need are already here' - solutions created by the caring, generosity and brilliance of everyday people working in education." —Margaret J. Wheatley, author of Leadership and the New Science and many other books. "At a time when school reform has become synonymous with ill-conceived initiatives, it is refreshing to encounter a book that offers hopeful ideas, grounded in experience." "Today, more than ever, all the forces within society must join together to prepare our children to meet the challenges of our rapidly changing world. Schools That Learn is an important resource for all those wanting to tackle the challenge of integrating family, school, faith community, and policymakers into one coalition on behalf of children." "I don't know of a country that is happy with its educational system. That is because most schools are crafted for the mass production ethic of industrial society. Changing this obsolete state of affairs is the best investment that a government or community can make. This book can help; it shows how schools can reorient themselves to emphasize humanity, adventure, entrepreneurship, leadership, teamwork, problem-solving, and experimentation, instead of rote learning." "I plan to read long passages to my daughter. Whenever I think about the world in which she (and her children) will grow up, the educational system seems to be the locus of both hope and despair. Reading this book is like opening the curtains and letting in rays of hope, illuminating an entire, systemic, detailed map for change." "It took us three years to define the standards we expected of students, because we engaged the community from the beginning. It mattered to us that [the people of Memphis] own the standards." "Ordinarily, teachers are taught to work as individuals, so staff development has to help them learn to work together. And it needs to be an ongoing process, with enough time to learn new ways of teaching, to develop esprit de corps, and to unlearn old habits." "We work harder than kids in other schools. But we have more fun doing it. All the kids have different rates of learning, so the teachers keep up different rates of training."